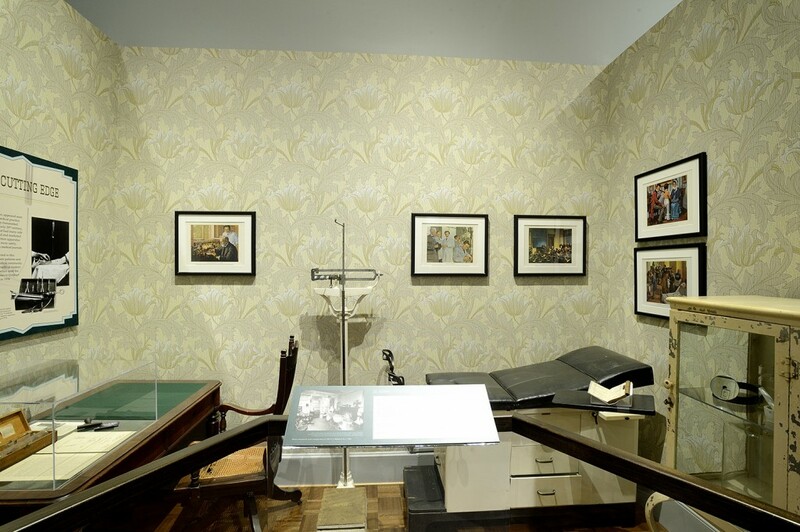 In the doctor’s office vignette, we have five framed color prints depicting ‘great moments’ in medical history. 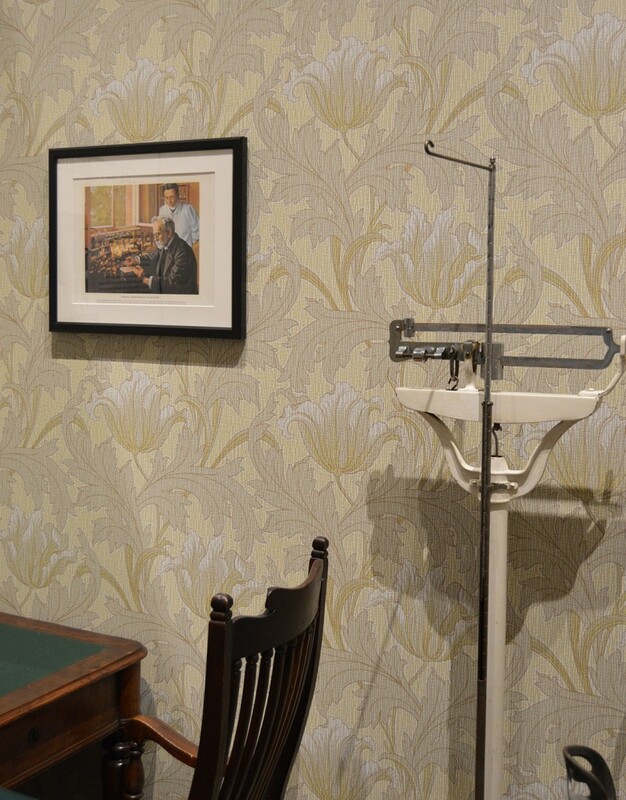 More than just set dressing, these prints – and a sixth, in a more prominent spot around the corner – represent typical (or at least idealized) medical office décor of the mid 20th century. The doctor’s office vignette in “Beyond Chicken Soup.” Photo by Will Kirk. In the late 1940s, Parke-Davis Pharmaceutical Company asked artist Robert Thom to create a series of 45 paintings, picturing milestones of medical history and focusing on the men* who made them possible. The paintings are rich in detail, and were meant to be as accurate as possible (even when the scene took place in, say, ancient Greece). The resulting images were reproduced in advertisements, promotional calendars, and other print media; the original paintings were sent on exhibit tours around the country; and portfolios of the full set were distributed to physicians around the United States, often given as graduation gifts to new doctors. In the 1950s, these ‘great moments’ pictures were seemingly everywhere. 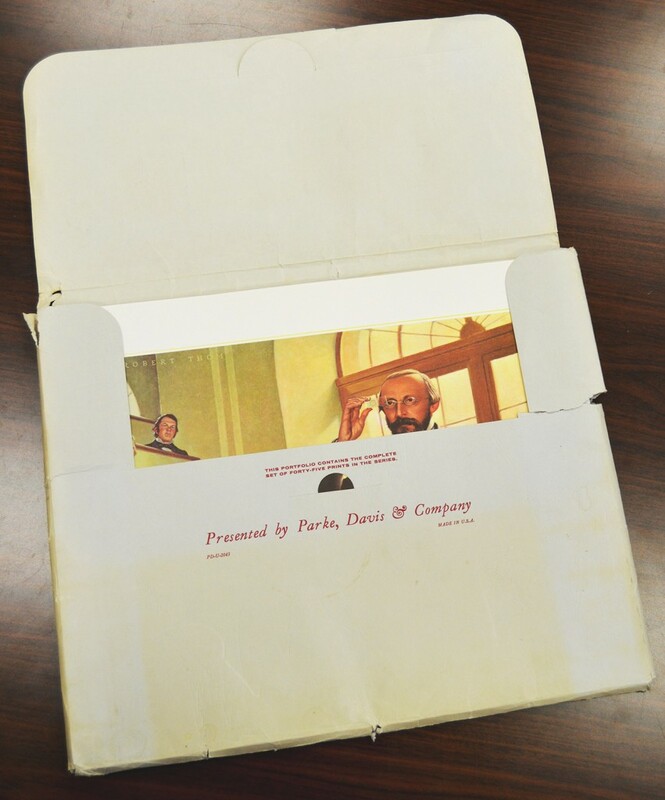 We were lucky enough to receive as a donation a full set of Parke-Davis’s “A History of Medicine in Pictures,” given to us by Dr. Adolph Baer, a University of Maryland Pharmacy School graduate and proprietor of several pharmacies in western Maryland. Complete sets are rare, and we were delighted to be able to add these to the exhibit. The images themselves are interesting, especially viewed through a modern lens; for example, in this article scholars Jonathan M. Metzel and Joel D. Howell discuss the ways in which the images tell us more about the pharmaceutical business in the 1950s than they do about the history they hoped to portray. Personally, though, my favorite part is the packaging – specifically the instruction sheet that makes it clear, in no uncertain terms, that these images were meant for public display. 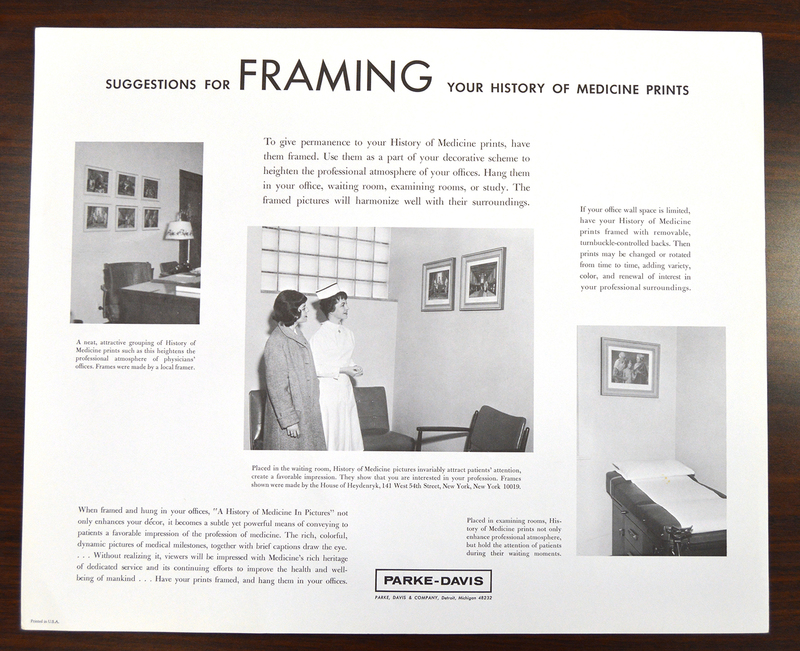 In case you still don’t get it, the last sentence is the unequivocal directive: “Have your prints framed, and hang them in your offices.” Unspoken is the hope that the viewers – and the doctors themselves – will associate all this upstanding medical progress with Parke-Davis itself, and choose to patronize the company. 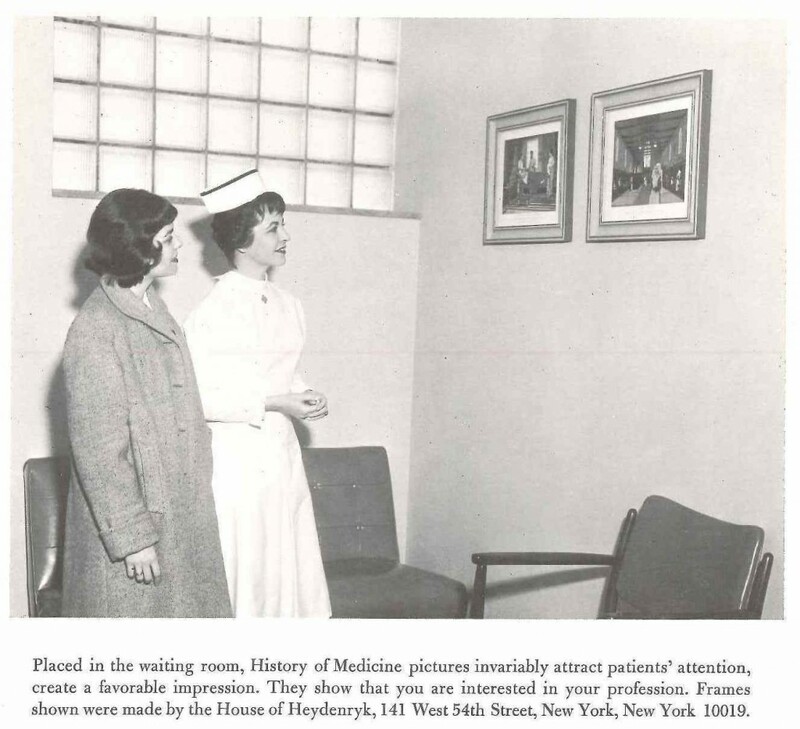 Today, Thom’s original paintings are owned by the University of Michigan; art historians and historians of medicine look at the images with a critical eye; and pharmaceutical ads tend to focus on a specific product (and more prominent brand placement) than on a foundation of medical progress. But the “History of Medicine” prints still hold a special place in the hearts of many older physicians and pharmacists, and we think they add a nice – one might even say professional – touch to our vignette. *Though there is some ethnic and regional diversity in the series, all the featured physicians are men. Doesn’t this office look professional now? We think so!